Promoting a culture of hospitality builds on Pope Francis’s prioritization of migration throughout his pontificate. His first official visit outside of Rome in 2013 was to Lampedusa where he addressed migrants and humanitarian volunteers. During his address to Congress in 2015, he called on the U.S. to offer compassion and concern for those who migrate, saying, “We, the people of this continent, are not fearful of foreigners because most of us were once foreigners.” And in 2016, he visited the U.S.-Mexico border to celebrate mass and pray at the border, a visit that led to a more outspoken stance regarding the building of walls and marginalization of immigrant populations in the U.S.
La Campaña por la Hospitalidad campaign logo. The idea of a “campaign” evolved from observing similar efforts in Central and South America, where a network of Jesuit institutions initiated “La Campaña por la Hospitalidad” over two years ago as a response to a call to action from the Global Ignatian Advocacy Network‘s working group on migration. Along the same lines, to counter the growing anti-immigrant sentiment in Europe, Jesuit organizations in Spain developed a campaign called “Hospitalidad.es” that sought to unite people around a culture of welcome and compassion. Observing these efforts over the past few years, the Jesuit Conference of Canada and the United States’ Social and International Ministry Commission desired to foster a campaign that would engage the United States and Canada. The Ignatian Solidarity Network was selected to coordinate the campaign, working in partnership with Canadian and U.S. organizations in the Jesuit and broader Catholic network, as well as international partners. ISN received funding for the campaign from the Commission’s Social Action Research Grant program. 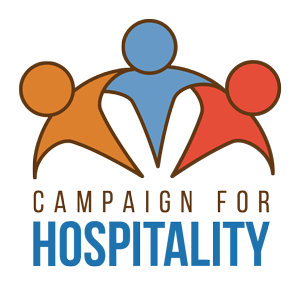 The Campaign for Hospitality is built around three tenets for how it engages people: encounter with those in our nations who have recent migration stories; understanding, providing resources and pathways for people to understand issues of migration both intellectually but to also develop empathy for the challenging realities faced by those who migrate as immigrants, refugees, and asylum seekers; and action, inviting people and communities into direct forms of hospitality, popular education, and advocacy.